He vows to crack down on all marijuana use if elected, but most Americans live under liberalized pot laws. If Chris Christie is elected president and follows through on his vow to enforce all federal marijuana laws, medical marijuana dispensaries, like this one in Portland, Oregon, would have to close. No presidential election truly feels real until there’s a solid incident of hippie-punching, and New Jersey Gov. Chris Christie was happy to throw the inaugural punch this week by telling pot smokers that as soon as he’s in the White House, the party is over. That apparently applies to medical marijuana users, too. Christie said he would enforce the federal laws prohibiting all use and possession of marijuana, which rank the plant as dangerous as heroin and provide no exception for medical use. Christie’s intention may have been to assure the Republican base that the governor of a blue state with a medical cannabis policy is no friend of the reefer or just to shore up his law-and-order bona fides. But his statement was a clear warning to those states that have legalized recreational use, which now include Colorado, Washington, Oregon and Alaska, as well as Washington, D.C.
That legalization exists solely by the grace and restraint of the Obama administration’s Justice Department. In a 2013 memo to U.S. attorneys, Deputy Attorney General James Cole explained how the Justice Department was handling states’ moves to regulate and legalize marijuana sales: namely, prosecutors would use their discretion and allow sales to continue, provided that states were ensuring that marijuana was unavailable to minors and not funding the illegal drug trade, among other requirements. Essentially, federal agents are still well within their rights to knock down doors of cannabis dispensaries because of their violation of federal drug statutes. But they don’t, because that’s a lot of work and in the eyes of the Obama administration, as long as marijuana businesses are not fueling interstate drug trafficking, the feds have better things to do than walk through Denver with a mile-high stack of subpoenas. When it comes down to popular acceptance, that ship may have already sailed. A majority of Americans now support legalizing marijuana. And most Americans live in states with liberalized marijuana laws, with vast segments of the population able to acquire medical cannabis should they get a doctor’s approval. Indeed, if Christie were to gain the White House, he himself would become a resident of a district that has legalized marijuana. Decriminalization is the most low-level legal change that a state can make to its drug laws and makes the crime of possessing a small quantity of marijuana into a minor offense involving a fine or summons for first-time offenders rather than jail time. Possession is still illegal, but in 14 states, a little bit might not land you behind bars. 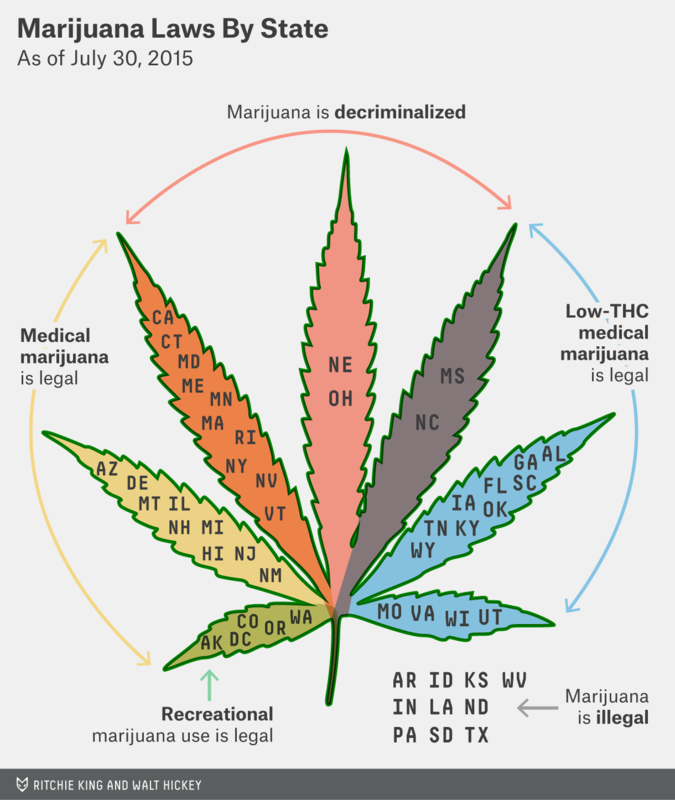 For medical marijuana, states have taken two (at the moment mutually exclusive) approaches. One, in 24 states, makes full-strength cannabis available to patients in one form or another, maintaining the psychoactive properties of the substance and keeping all the THC, which is the active ingredient that makes music sound really good. The other path, in 15 states, allows medical marijuana products to be provided to patients as long as the pot has had its psychoactive component reduced, essentially allowing cannabis that does not get patients high. Should he win the presidency, Christie may find his promise to enforce the war on cannabis difficult to keep. Because if there’s one thing we’ve learned about wars, the key is winning those hearts and minds. And America’s hearts and minds appear to be with the other side.